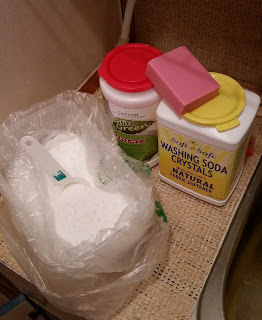 I have been busy researching how to make my own laundry powder and fabric conditioner. For me there were too many perfumes going on in each product bought from the supermarkets. They would irritate my nose and interfere with my own personal choice of perfume I would rather smell of. So after some extensive research on the internet, this is the recipe I have settled on. And it works a treat. In fact my washing looks cleaner, especially my lights and whites. I have been very impressed. I haven't worked out just how economical it is until I run out. But from what other homemade enthusiasts have written the recipe amount can last for up to 11 months. Of course it would depend on the size of the boxed quantities used and how often you machine wash per day/week. I can't wait to see. So here is the recipe that I am now using. In a large container used only for this purpose mix together the Borax and Washing Soda. Grate the large bar of soap and mix in. Store in an airtight container. I use 2 tablespoons of powder per normal frontload wash. If washing heavily soiled clothing I use more. Give it a try. It will be more economical, more green, saving the planet and lighten allergy sufferers within your family.